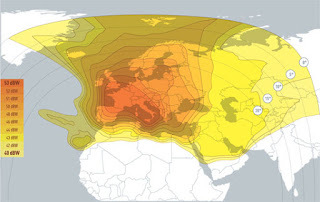 Hot Bird is a group of satellites operated by Eutelsat, located at 13°Eover the Equator (orbital position) and with a transmitting footprint overEurope, North Africa and the Middle East. Only digital radio and television channels are transmitted by the Hot Birdconstellation, both free-to-air and encrypted. In addition there are a fewinteractive and IP services. The satellites currently operate at 13° East and are numbered 13B, 13C and 13D.